I lost track of Ben while I was married. Seven years. I hadn’t seen Ben in 7 years. Ben refers to those years as my domesticated years. I lost track of a lot of things that were important to me then. Then one day, about a year after my divorce, he sends me a link to an article about the 9 best waterfalls in southern Indiana. 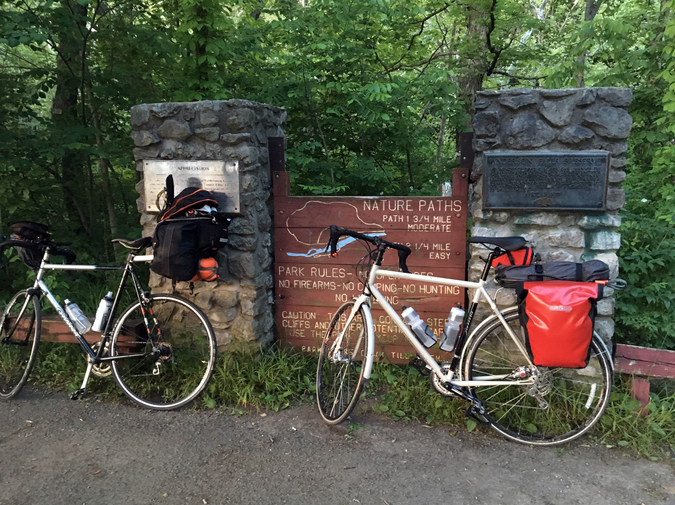 Then another link to a Google Maps route he’d mapped out—a 400-mile loop on bike-friendly country roads that would take us to all 9 of them in 5 days. We were done for the day—75 miles behind us, the sun set into the Ohio River, our tents pitched just 10 feet from the semi trucks howling along the highway. We sat on a wall outside Madison, Indiana, passing a traveler of Knob Creek between us. The air dark. Our cigarettes floated in front of us, flickering like orange fireflies. For a long while, we said nothing. The miles felt longer, heavier on our legs than when we last rode together. People always say the best friendships are the ones that can pick up right where they left off. I suppose there’s some merit to that. It didn’t take long for Ben and I to find our cadence again. But it did take a couple days to ease back into the depth we had before. The first night, we spread our sleeping pads out on the tables of a picnic shelter within earshot of the first waterfall. We split our first bottle of whiskey and caught up quick. He told me about living in Portland and I told him about what I’d begun to learn about myself again being out on my own. But it was mostly easy. It was mostly things I’d already told others, things I already felt comfortable sharing in mixed company. Tonight, though. Tonight was different. Tonight we were confessing, we were going beyond the blame we could place on others. I told Ben about the deep hole I’d dug in myself the past several years and all the ways I tried to fill it. I told him about binging, about purging, whether through hours on a bike or through laxatives. I told him about the other women. I told him about how it felt to give up trying to make my marriage work, how it felt to walk out. Ben told me plenty, too, but that’s his to share. We talked less about how others had failed us, and more about how we had failed others, how we had failed ourselves. We were quiet again. The cars ripped past us. The whiskey had settled into our tired muscles, had numbed the swollen ligaments in our knees and ankles. Liquid sloshed as Ben took a pull off the near-empty bottle. He passed me the bottle and I dumped the last bit of Creek into the back of my throat. The bourbon-burn went to work on the almond-sized lump growing there, the taste of warm oak and caramel overtaking that copper taste of rising tears. If you find someone who can be proud of who you are when you are not proud of yourself, never give up on them. I know now I’m wired to give myself away. From a young age, I was the caretaker, I was the peacemaker. I’ve written 1,000s of words on this, and you’re welcome to read them if you don’t trust me. But suffice it to say, by the time I got married, I had already learned to become small to be loved—to give up who I am, what I want, my own happiness—for the happiness of another. It’s important at this point for me to say outright: I don’t believe my ex had much clue how unhappy and hollow I felt in our marriage. I masked it all too well, shifting hobbies and friends and jobs and passions so I could still laugh easily enough and for the most part feel fulfilled in my life. I masked it so well that in some ways, I didn’t even know until years after moving out. Before my marriage, I was something feral. I spent weekends in the woods beating my body against boulders. Or downtown Indy on my bike. Ben was there. All my friends were there. We were bright flashes through traffic, our legs wild pistons, our drunken laughter echoing from the tops of buildings and the rafters of overpasses. There were ambulances and arrests and overdoses and funerals, and these things all felt normal and familiar and by familiar I mean they made us family in the way a group of 20-somethings with the same sorts of scars can find each other and come to feel like family. In hindsight, these things meant more to who I am than I knew. What I gave up, I gave up in increment. First it was climbing, and more slowly, cycling. I’d see my friends less and less. In my own way, I convinced myself I was simply growing up, simply putting away childish things. There are so many parts of the trip I want to tell you about: how it feels to ride the two-mile downhill into Lake Monroe valley and ride the bridge into a perfect Indiana sunset. How we camped in a cemetery only to be woken up by a cop reminding us that it was Memorial Day. How we couldn’t see the last waterfall because the police had closed the park earlier in the day to investigate a drowning. But I have only so many words until you lose interest or until this becomes self-indulgent. This is the best way to wrap this up. The fireworks shop was owned by two grizzled men wearing overalls and camouflage. While we shopped, one of the men cleaned under his fingernails with a buck knife. Ben and I bought at least 10-15 pounds of each: an assortment of bottle rockets, Roman Candles, and larger rockets guaranteed to put on a show. The last night of the trip, we stayed at my dad’s house. My step-mom was out of town, and Ben and I had hauled the fireworks the entire 350 miles since that shop. We grilled steaks for dinner while Dad built a fire in the backyard. By the time the fireworks came out, we were half a case of High Life into the evening. I was returning from getting a fresh beer when a Roman candle erupted, the sparks sizzling the air just inches from my ear. My dad a deep guffaw from his lawn chair by the fire, Ben and I in hysterics. I bolted to my bike where my arsenal was stashed and we made a game of darting around the yard, firing Candles and slinging bottle rockets at each other. When the Indiana humidity began to fizzle the fireworks, my dad returned from pouring himself a drink carrying a shotgun. “Pull!” he would shout. We’d throw a rocket into the air, a resounding blast from my dad’s gun, the fireworks would shower into a rainbow of sparks and we would fall over laughing. In just a few weeks, I’ll be 35, my dad squarely in his mid-60s. I come by my antics honestly—this itch in the deepest parts of who I am to live wild, to drink deep, to find family in those who are called to roam. My dad has ever been an example to me, and even in his marriage with my step-mom, I can see that a partnership can exist that allows two people to live in their own wild without asking the other to make themselves small to be loved. I’m not going to pretend I can write an ending to this any better than John Steinbeck wrote the beginning of Travels with Charley, a favorite of mine that if you haven’t read, should be the next book on your list. Christopher Newgent lives in Indianapolis. He asks himself questions to remember who he is at The 36 Questions.